Bonhams New York December Fine Jewelry sale, held December 3, saw a an 18.04-carat emerald-cut diamond ring sell for $828,500 – more than double its low estimate of $400,000. Bonhams said that the ring saw some “fierce bidding”. 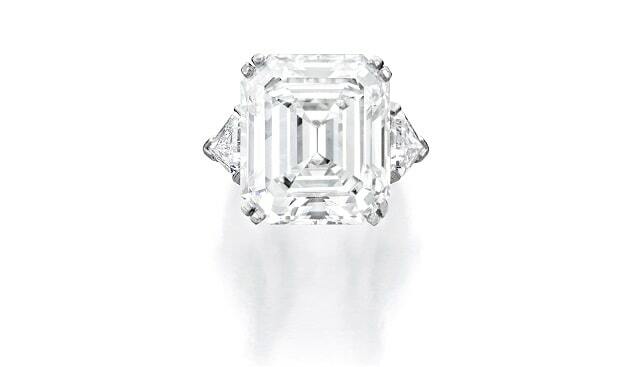 Another top performing lot was a diamond solitaire ring by Royal De Versailles. The 7.01 carat round brilliant-cut diamond sold for $275,000, also exceeding its pre-sale estimate of $180,000 – 250,000. Other notable lots included a pear-shaped brilliant-cut diamond ring, weighing 5.03 carats, which sold for $250,000; and a pair of heart-shaped diamond earrings, weighing 4.04 and 4.00 carats, sold for $112,500. In addition, Bonhams reported that demand for a historic Kashmir sapphire was high during the sale: A sapphire and diamond ring from 1900, featuring a square cushion-shaped Kashmir sapphire and weighing 3.00 carats, sold for $125,000 – five times its pre-sale estimate of $18,000 – 25,000.